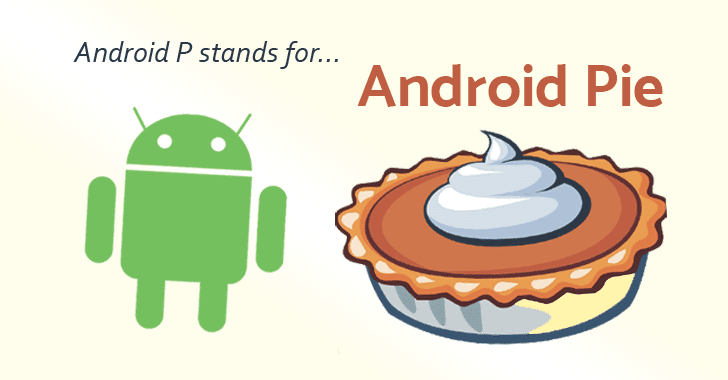 If you have bet on Peppermint, Pancake or Pastry for "P" in the next version of Google's mobile operating system, sorry guys you lose because Android P stands for Android Pie. Yes, the next version of sugary snack-themed Android and the successor to Android Oreo will now be known as Android 9.0 Pie, and it has officially arrived, Google revealed on Monday. Google says Android Pie comes with a "heaping helping of artificial intelligence baked in to make your phone smarter, simpler, and more tailored to you." Despite Google has made its efforts since it brought a power saving mode called Doze in Android 6.0 Marshmallow, Battery life has always been a big concern for people. Android 9 Pie introduces a new feature called "Adaptive Battery," which uses machine learning to learn which apps you use most and prioritize battery for them accordingly. "Android 9 introduces a new battery management feature, App Standby Buckets." Android official documentation site says. "Based on the app usage patterns, each app is placed in one of five priority buckets. The system limits the device resources available to each app based on which bucket the app is in." Android 9 Pie also comes with a new auto-brightness algorithm, which is also powered by AI to learn how users like to set the brightness in different settings, and does it for them. Android Pie has a new feature called App Actions that helps users get things done faster by predicting what they will want to do next based on their context and displays that action right on their smartphone. "Say it's Tuesday morning and you’re preparing for your commute: you’ll be suggested actions like navigating to work on Google Maps or resuming an audiobook with Google Play Books," Google explains. "And when you put in headphones after work, you may see options to call your mom or start your favorite Spotify playlist." This is an important feature added to Android Pie which allows apps to shows a "slice" of relevant information from other apps when the operating system believes you need it, like showing you real-time pricing from services like Uber or Lyft when you are searching for a ride. "If you start typing 'Lyft' into Google Search, you’ll see a "slice" of the Lyft app, showing prices for your ride home and the ETA for a driver so you can take action more quickly and easily." Google says Android Pie enables industry-leading hardware security capabilities that allow protecting your sensitive information such as credit card data using a secure, dedicated chip. Besides this, Android Pie also brings important privacy improvements, like "TLS by default and DNS over TLS to help protect all web communications and keep them private." In addition to these features, Google has also introduced new gesture-based system navigation in Android Pie that features a single home button, smart text selection, gesture navigation, and Wi-Fi round-trip time (RTT), while digital wellbeing coming in the fall. According to the tech giant, Android Pie is starting to roll out today as an over-the-air update to Google Pixel phones, while other Android devices will receive Android Pie "by the end of this fall." All you have to do is open device Settings > System > System Update to see if the latest update has landed on your handset. You may even get an alert via system notification as well that the Android 9 Pie update is available to download and install. Just make sure your phone is charged before you start an Android update. Android devices, including OnePlus 6, Sony Xperia XZ2, Xiaomi Mi Mix 2S, Nokia 7 Plus, Oppo R15 Pro, Vivo X21, and Essential PH‑1, which were part of the Android P beta program, as well as "qualifying" Android One devices will also receive the Android Pie update by the end of the fall. Google also added that Android Pie won't be coming to Nexus devices and that it is working with "a number of other partners to launch or upgrade devices to Android 9 this year" in an attempt to give more people access to the platform.